AUSSIE ace Ty Proctor becomes King’s Lynn’s third signing for 2019. 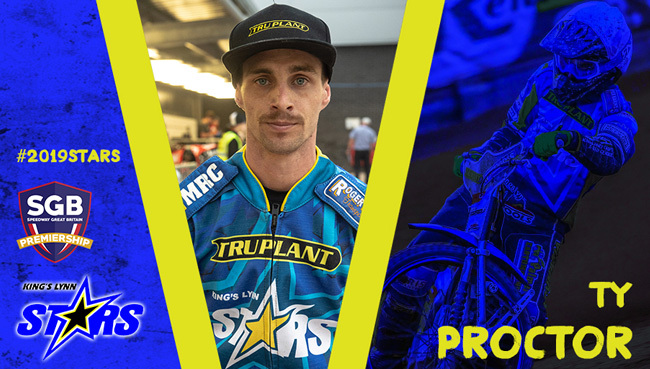 Proctor was one of the Stars’ most consistent riders last season, finishing third in the clubs’ averages despite struggling with injury. He said: "Last season was Ty’s first back in the Premiership for a few years and to perform the way he did overall was quite admirable. We made him vice-captain and he was absolutely fantastic with the rest of the boys. "He was a big part of the groove that held things together and he increased his average quite significantly. "It's quite funny with Ty because the Ty Proctor that fans see on raceday is nothing like the Ty Proctor we see away from raceday. "He's lots of fun, always got plenty of jokes up his sleeve which are often at someone's expense and he really is great for team spirit and atmosphere. "Ty never shirks responsibilities, he's full of character and determination, and I still believe he can improve. I'm really looking forward to having him back in the team and really looking forward to seeing what he can do in 2019."